Cairo Dispatch: Can Egypt’s Liberals Challenge the Military’s Hegemony? Cairo—On February 10, 2011, Field Marshal and then-Deputy Prime Minister Mohamed Hussein Tantawi intercepted a decree that Egyptian President Hosni Mubarak sent to state television, in which he announced the replacement of the head of the Republican Guard, a Cairo-based army unit partially tasked with preventing against the possibility of a military coup. Tantawi had opposed the use of military force against the nearly 15 million protestors who had taken to the streets since January 25, and he had helped prevent the situation from escalating into a Tiananmen Square-style bloodbath. Fearing that Mubarak’s decree would both marginalize the military and fail to prevent the country from spiraling out of control, Tantawi decided to act. The next day, the army sent Vice President Omar Suleiman a short statement announcing Mubarak’s resignation—and it sent the former president to the Sinai beach resort of Sharm El Sheikh. The question is whether there are enough people thinking twice to mount a real challenge to the military’s outsized influence over Egypt’s affairs. And, if they aren’t, whether international pressure—namely, from the United States—could help get the job done. SCAF IS COMMITTED to an October or November date for parliamentary elections, a sign that it doesn’t want to jeopardize its goodwill by continuing to directly govern Egypt. “The military council is the only thing that’s holding the transition together,” says Mansour. Yet, since Mubarak’s resignation, there has been obvious tension between the military’s role in democratizing the country and its anti-democratic commitment to preserving its singular place in Egypt’s social, political, and economic life. SCAF has been playing an oftentimes-schizophrenic double game, oscillating between soft control of the country’s institutions and heavy-handed, stability-minded direct rule. “This is a caretaker government when the military wants it to be and a revolutionary government when the military wants it to be,” says Mansour. This contradiction was laid bare on August 1, when the military forcibly removed activists who had been occupying Cairo’s Tahrir Square since a major protest on July 8. Among the activists’ grievances was the military detention of an estimated 10,000 individuals arrested during demonstrations after January 25. FEP has a broadly pro-trade and anti-corruption platform, so the fact that the military is currently exempt from the party’s critique of the country’s problems points to its deep entrenchment in Egypt’s power structure. It also points to the unlikelihood of this changing in the near term. Indeed, by all accounts, despite many liberals’ growing concern about the SCAF, there is only a small constituency in favor of a major, January 25–like confrontation with the military. Part of the problem is a disillusioned (or, in the case of Yaacoub, complacent) sense that the military is simply immovable. But it would also be difficult to muster public support for this kind of a confrontation. “For most of the people who went to the street [to protest last January] the problem was not the military regime,” says journalist Mohammad Rauf. And, today, considering the army’s continuing popularity, discussion of the military’s future role in the country’s politics is a likely non-starter. “You cannot get people to be rallied around that debate,” says Mansour. Activists received unsettling proof of this fact on August 1. When the military ejected the tent protestors from Tahrir, shopkeepers and passersby cheered them on. IF EGYPTIAN LIBERALS can’t do much to influence the military, who can? The United States government, for one, has the kind of leverage over Egypt’s armed forces that activists could only dream of. According to an official source familiar with the U.S. government’s operations in Egypt, there are around 300 U.S. military personnel in Egypt, along with “tens of thousands” of military contractors. Cairo is home to the world’s only production line for the M1 tank. According to the source, SCAF is concerned with creating the political conditions that “allow the military to continue its business relations with the United States.” The Egyptian military also has a badly antiquated armored corps, some of it dating from Egypt’s pre-Camp David Treaty alliance with the Soviet Union. The Egyptian military needs American money, but it is also in dire need of American guns. The U.S. could easily leverage its influence with the Egyptian military in exchange for relatively small but important political concessions, like the admission of monitors into the country for parliamentary elections, or the release of activists currently under military detention. 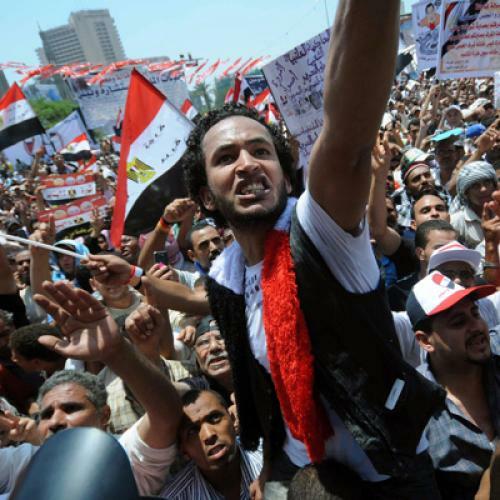 (Washington already gives grants totaling over $100 million a year to Egyptian pro-democracy groups and NGOs.) Yet, so far, it has done little to directly pressure SCAF. On July 28, days after the military council announced that it would not allow election monitors into the country, State Department spokesperson Mark Toner affirmed that SCAF was “leading this transition towards a democratic change and elections.” He said that the admission of election monitors was “ultimately … a decision for the Egyptian people to make.” That same week, several high-ranking Egyptian military officers made an official visit to Washington, meeting with both Pentagon officials and members of Congress. And the State Department and U.S. defense establishment are reluctant to clash with Egypt’s military leadership. After the parliamentary elections, Egypt could soon find itself under the first civilian government chosen by its people in the country’s history. But, given its entrenched popularity and influence, along with the reluctance of the Egyptian public, liberal activists, and the U.S. to challenge it, the military will still hold disproportionate sway over the Egypt’s politics and economy. In other words, Egypt will find itself in a place similar to where it was before January 25: beholden to the self-interest of those in power. Armin Rosen is a freelance writer.